It's my life, even when I am trapped in the machine. My Life Scorecard December 22, 2014 today, Andy Lee Graham in Orland, Indiana for Christmas. I wrote this to myself today, maybe a little Christmas gift for me. Paradise lost presumes that we at one time had paradise, and somehow lost it, generally that we failed, and lost paradise because of weakness on our part. Yet, what a lofty word this paradise, used way too often, too easily as if we are all in paradise. And, how do we know what paradise is? I suspect it means a place where little of any self-doubt, or preoccupation with leaving, we have no desire to leave. Many of you realize, I, Andy Lee Graham have spent the last three months in Europe, and it feels as if my paradise travel lifestyle was in danger, and while in Europe, I often felt as though it was going to leave, depart, that indeed I had lost the plot, the path, the way back to my self-made lifestyle; maybe I was lost, maybe I would somehow forget how to return to paradise. I was frightened for the first time in 16 years, first I made one compromise, then another, next thing I knew I was trapped. Please, I was once trapped by the machine for 19 years, and guess what, that too was my fault. 24 Years - Age 1-24 -- lived my life. 19 Years - Age 25-42 -- lived the life I was expected to live by my culture. 16 Years - Age43-59 - lived my life. It would be nice if we could just pretend we never lived our lives, but the scorecards of life are cruel. I like that line about time machines. Is that form a book or did you come up with it on your own? I hope your find your way back to your own paradise. 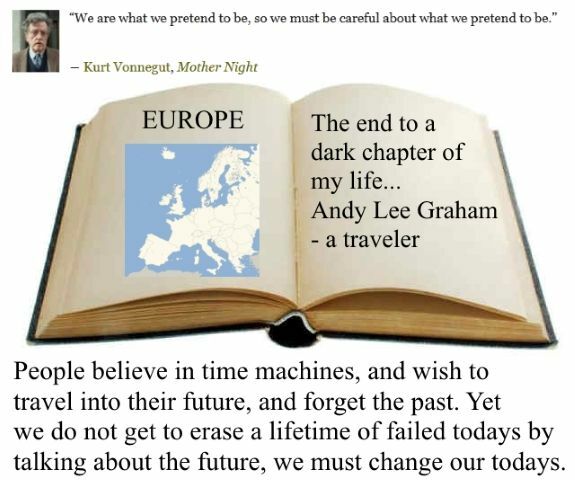 I wrote the thing about time machine, trying to explain in different words the quote from from Kurt Vonnegut. These two quote mean almost the same thing, we must always be careful, whatever life we are living today, yesterday, and the future is who we are, we don't just get to pretend we are the person in the future. talking about the future, we must change our todays." Being frightened and being trapped, while very real feelings, are not reality. They are illusions formed in our minds and can only effect us if we let them and many of us do. That is why so many of us watch your travels feeling like we can't do the same. What was an eternity in Europe is now now but a blink of the eye memory, a re-learning experience. Your paradise travel was never in real danger, the invisible prison bars were never really there. We all have faith in your ability and never doubted your return to your path. As for the Hobbit movies yes,,, they can be sleepers lol. We had a Hobbit binge watching the old ones getting ready to go and see the new release I will confess, I had some good sleep time tee hee hee.